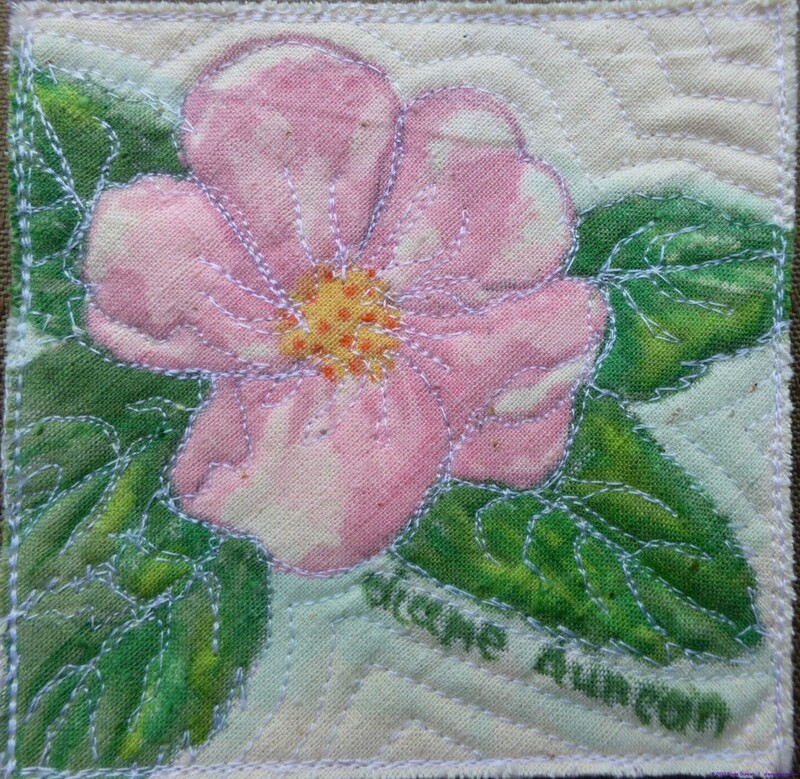 My 4″x 4″ contribution to the Alberta Flood Rose Project 2013. The Alberta Flood Rose Project is a fundraiser for the Alberta flood relief work of the Canadian Red Cross as they respond to the recent flooding in Southern Alberta. Calgary and area artist have been asked to donate a 4 inch by 4 inch piece of original art depicting the Alberta Wild Rose – the provincial flower – in the media of their choice, for inclusion in one of a series of mosaics or collection pieces (100 per collection) that will be assembled and framed. The collection pieces will be exhibited during August and then auctioned to raise funds. Terri Heinrichs, a Calgary artist launched this project on June 28th and the submission deadline for participation is Friday, July 26. As usual, I’m working to deadline but am fairly happy with this small piece. The background is unbleached cotton and the rose is painted with alcohol inks and then quilted. I’m looking forward to seeing the assembled works when they are exhibited. I’ll drop this off at one of the collection points on my way to the airport in the morning. My son is arriving for a visit!